Niccol- Machiavelli's seminal work, The Prince, argued that a ruler could not govern morally and be successful. Giovanni Botero disputed this argument and proposed a system for the maintenance and expansion of a state that remained moral in character. Founding an anti-Machiavellian tradition that aimed to refute Machiavelli in practice, Botero is an important figure in early modern political thought, though he remains relatively unknown. His most notable work, Della ragion di Stato, first popularised the term 'reason of state' and made a significant contribution to a major political debate of the time - the perennial issue of the relationship between politics and morality - and the book became a political 'bestseller' in the late sixteenth and the seventeenth century. 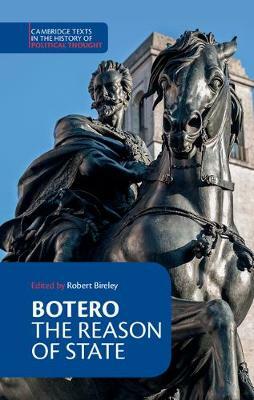 This translation of the 1589 volume introduces Botero to a wider Anglophone readership and extends this influential text to a modern audience of students and scholars of political thought.